Always know what your allies and enemies choose to ignore. Cryotek is one of the most deadly and mysterious figures in the history of Cybertron's criminal underworld. Though he was once considered one of the planet's most gifted engineers, Cryotek became increasingly dissatisfied with the actions of the Predacon ruling class - leaders who he felt had too quickly abandoned the classical Decepticon philosophies of conquest and deceit. Relying on the more illicit opportunities available to a being of his considerable skills and intellect, Cryotek eventually became one of the most dangerous outlaws on Cybertron - one more than willing to apply his scientific talents to the less-than-noble pursuits of extortion, theft, and criminal mayhem. Cryotek's logical mind and pragmatic bent have made him an extremely successful gangster, one who approaches each new "business venture" with the discipline of a trained researcher. Nevertheless, Cryotek does find the time to take great pleasure in his work. The ingenious malefactor behind the theft of the legendary Golden Disc and one of Megatron's earliest mentors, Cryotek was eventually betrayed by this former pupil as Megatron fled Cybertron to pursue his fortunes on prehistoric Earth. Upon Megatron's return, Cryotek struck up a bargain with his old student, willingly "assisting" Megatron with the elimination of his hated beast form - or at least those elements that Cryotek could most readily exploit! Unprepared for the painful metamorphosis involved in assuming Megatron's Transmetal II body, Cryotek was sent into temporary stasis lock, allowing his research and development operations to fall into Megatron's waiting hands. 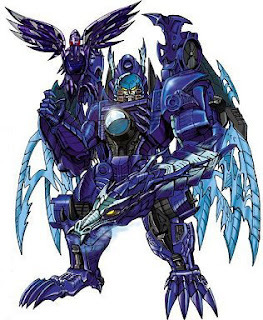 Left betrayed both by his former protégé and his own pursuit of power, Cryotek recovered only in time to see his empire - and Cybertron - fall completely to Megatron's sinister designs.